This is a collection of general interest publications from the U.S. Geological Survey on rocks, fossils, and other geology topics. The author discusses the historical significance of rocks. 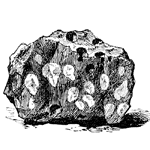 Tips for the proper collection, identification, classification, and housing of rocks are presented to the reader. The authors discuss the formation and analysis of fossil formations. The author conveys his thoughts on the overuse of technical language in the discussion and explanation of the natural sciences. FCIT, . Geology Anthology. Lit2Go Edition. 2012. Web. <https://etc.usf.edu/lit2go/157/geology-anthology/>. April 24, 2019. FCIT, Geology Anthology, Li2Go edition, (2012), accessed April 24, 2019, https://etc.usf.edu/lit2go/157/geology-anthology/.